The existence of karst features and conduit flow in silica-rich rocks has been increasingly recognized around the world. Well-developed quartzite karst is known in tropical settings, such as southern Venezuela and eastern Brazil. However, little is known about the hydrogeological behavior of these terrains. Pioneering water tracing studies were performed in the Proterozoic quartzites of the Chapada Diamantina (Diamontiferous Plateau) of central-eastern Brazil, using the tracers amino-G and uranine. Tracer detection was performed by four in situ fluorometers, granular-activated charcoal receptors and water analysis. Hydrochemical conditions resulted in contrasting performances of the tracers, with uranine providing some positive results and yielding clear breakthrough curves. Low-pH water and high-fluorescence background levels appear to considerably inhibit tracer performance and add difficulties in the interpretation of some tracer tests. A preliminary assessment of flow routes and the main characteristics of groundwater dynamics in this quartzite area are provided, with insights on the behavior of the tracers under acidic (pH = 4–5) water conditions. We acknowledge the help of the local guide, Chiquinho, in showing us springs, swallets and caves in the study area. 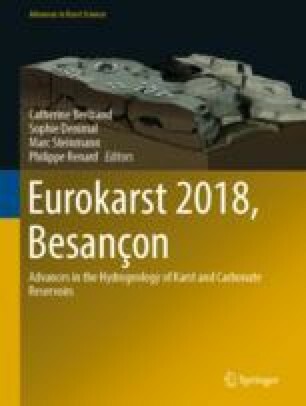 The staff at European Water Tracing Services (Belgium), Hidrovia Hidrogeologia e Meio Ambiente (Brazil), and Carste Ciência e Meio Ambiente (Brazil) helped with analyses and various aspects of this manuscript. Special thanks to Bárbara Zambelli, Caroline Reis, and Rafael Cruz for helping with data and figures and Daniel Menin for providing photograph.